High Commissioner for Human Rights Navi Pillay. The United Nations human rights chief today called for an independent international investigation into the deadly clashes between striking workers and police in the western town of Zhanaozen in Kazakhstan in December last year. 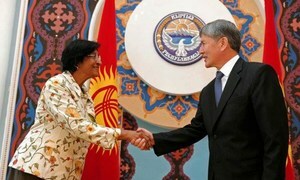 “It is extremely damaging to Kazakhstan’s reputation to have so much uncertainty hanging over such a serious episode resulting in substantial loss of life,” said the High Commissioner for Human Rights, Navi Pillay, at a press conference in Astana at the end of her first mission to Kazakhstan, as well as the Central Asia region. “I have recommended to the Government that the only way to credibly answer these questions once and for all, and draw a line under these tragic events, is to authorize an independent international investigation into the events themselves, their causes and their aftermath,” she added. At least 15 people were killed and more than 100 wounded when security forces and striking oil workers clashed on 16 December, 2011. The violence followed months of peaceful protests in the town. Since then, a number of demonstrators as well as police officers have been convicted on a range of charges, and the Government has given financial compensation to victims’ relatives. However, Ms. Pillay underlined, there were still many issues surrounding the incident that remain to be addressed such as the use of indiscriminate force by authorities, allegations of torture, and corruption, among others. Ms. Pillay also emphasized that an independent investigation could mark a defining point for the country in terms of how it handles human rights violations. “The Zhanaozen events, if properly investigated and lessons drawn, could turn out to be a watershed for Kazakhstan. It contains, in microcosm, many of the human rights concerns and critical gaps in the country’s laws and rule-of-law institutions,” she said. The human rights chief underscored that the investigation would also help to examine the causes of the protest, including the deep disparities in the distribution of wealth in the country and unsatisfactory labour laws. During her visit, Ms. Pillay met with Prime Minister Karim Masimov and other Government officials, as well as with prominent human right defenders and civil society organizations. Earlier this week, the human rights chief visited Kyrgyzstan, where she called on the Government to boost its efforts to address corruption and discrimination. The United Nations human rights chief today called on Kyrgyzstan to boost its efforts to address corruption and discrimination, adding that they are severely hampering the nation’s economic growth and social prosperity.